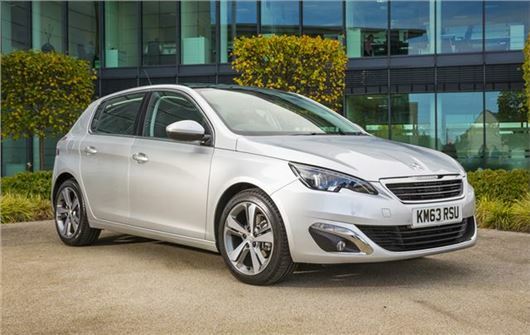 UK Car Discount has great deals on brand new 14-plate Peugeot 308 cars, with savings of more than £5000 on several models. Buyers will be the first registered keeper. All vehicles are UK dealer supplied with full warranty and are delivered free in mainland UK. UK Car Discount is one of the UK’s leading online new car dealers established since 2003, the company has sold millions of pounds of brand new cars. The Peugeot 308 Active model features 16” alloy wheels, electric front and rear windows, automatic windscreen wipers, rear parking sensor, colour touch screen display with sat nav, DAB radio, USB and Bluetooth support, dual zone air con, leather steering wheel and gear stick. The new Peugeot 308 Allure model adds the following features to the Active: 17” alloy wheels, hi-line front face with LED Xenon headlights, front fog lights, a reversing camera, front parking sensor and electric folding door mirrors. The new Peugeot 308 Feline model adds the following to the Active and Allure models: 18” alloy wheels, panoramic glass roof, front fog lights, half alcantara sports seats and keyless entry. For more Peugeot deals visit www.uk-car-discount.co.uk .